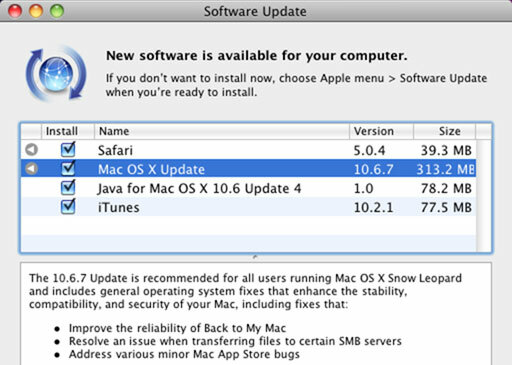 Two weeks ago Apple released the Mac OS X 10.6.7 version for the developers. Today they have announced the public release of this version and the update of this operating system is available to download on Apple support website. The new version has some key updates of the operating system including the AirPlay support. The new Mac OS X 10.6.7 is more good in terms of stability, compatibility and security. Bonjour service has been improved in this new version of Apple operating system beside the improvement in the Windows File Sharing (SMB) and Graphic drivers. Mac OS X 10.6.7 snow leopard has also fixed the bug in the Mac App Store which allowed pirates to download apps for free from Mac App Store. After just few hours of Mac App Store launch, it was cracked and was allowing free downloads on Macintosh computers. Next Next post: How To Clean Your LCD, LED & CRT Monitor TV Screen?